Inserted code cannot be traced properly with the debugger, making it hard to step through a procedure and possibly obscuring variable initialization and manipulation. Changes to the inserted code will force all the hosting stored procedures to need recompilation. The BLint() process that the compiler uses to check for suspected unassigned variables will not follow the $insert statement and process the insert record, making compile time errors more difficult to detect. However, whilst working on the new Form Designer we found there was quite a bit of common code that was shared between the various modules used by the form parser and compiler, and we obviously didn’t want to duplicate this in each one. Normally we would just move the code into a separate stored procedure and call that from each module, but that just adds extra overhead in a process that we really wanted to keep as fast as possible, and so we looked at another option: moving it into an insert record instead. Sharing the code this way means that it runs “inline”, thereby removing the need to create another call-frame, move variables on and off the stack, and so on. The shared code involved was fairly straightforward, well-tested, and limited to a few small subroutines, so the only real issue to overcome was: how can we easily update any “host” stored procedures in the event of the insert record being changed? Well, one of the nice things about the OpenInsight repository is that it tracks the various relationships between entities in an application, and some types support a method called TCOMPILE (Tree-Compile) that allows an entity to compile any other entities they are using during the compilation process as well. However, in this case we needed to do the opposite and compile those entities that were using the insert record instead, and so we created a TCOMPILE method for the STPROCINS type that processes this list of “used-by” entities and executes their normal COMPILE method after the insert record has been saved. This results in a simple way to ensure that changes are implemented across any affected programs. Whilst we wouldn’t say we exactly endorse embedding programs in this way, it does remain a useful technique for sharing code in some limited cases, and with the new TCOMPILE method it is now much easier to manage too. (* e.g. code statements such as “x = y + z; call msg( @window, txt );” etc, as opposed to simple constant declarations like equate statements). This entry was posted in Basic+ and tagged Repository on June 16, 2014 by Captain C.
One of the goals for version 10 is better OLE control (OCX) integration and support. A major part of that objective is the ability to register OLE controls with the IDE and bind them to the database in a similar fashion to the standard controls such as Edit Lines, Edit Tables and so on. In this post we’ll be taking a brief look at how this new functionality is being implemented. 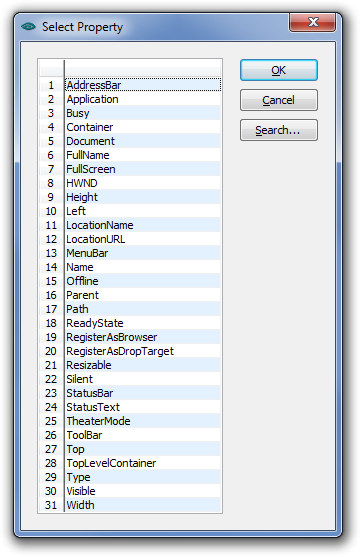 OpenInsight 10 supports a new repository type called “OLECONTROL”. This represents an OLE control “registration record” (stored in the new SYSREPOSOLECONTROLS table) which contains basic information, such as its CLSID and description, and the information needed for data binding, such as the name of the OLE property to use for the DEFPROP property. The simple form below shows the information that can be held for an OLECONTROL entity (Note that this form isn’t final, right now it’s a “bare-bones” version that is being developed further to integrate with the new IDE, but it does allow full testing and validation). The first, and most critical item of data, is the Class ID (CLSID) of the OLE control, which is a 128-bit number (called a GUID, or Globally Unique IDentifier) that uniquely identifies it. 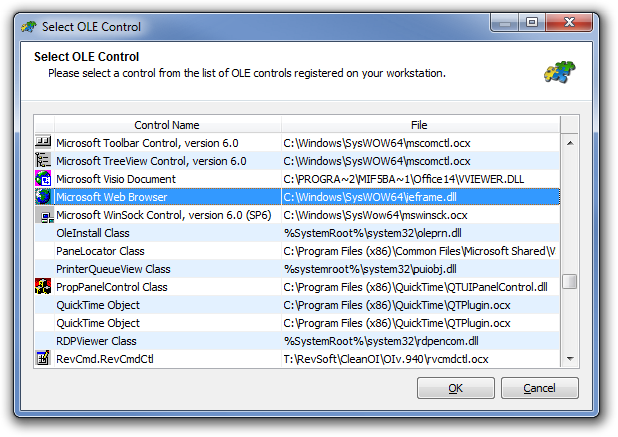 When you install an OLE control onto a system, the CLSID is used as a key in the registry where various bits of information about the control are stored. Older versions of OpenInsight have always required you to enter the CLSID manually when using OLE controls with the Form Designer, and this can be a tedious task if not provided with the control’s documentation, usually needing a good trawl through your Windows Registry or a special tool like Microsoft’s OLEView to find it. With version 10 we’ve included a new dialog that does the heavy lifting for you when you want a CLSID: It enumerates all the OLE controls that are installed on your system and presents them as a list for you to choose from, returning the CLSID when you click “OK”. Once you have specified the CLSID you can save the record without any further input if you wish. The control won’t be data-bound but it will be added to the tool palette in the Form Designer as a new item so it is readily available for subsequent development purposes. If you wish to support data-binding the next item to specify is the DEFPROP property, which is a “synthetic” property that maps onto a “real” property (such as TEXT, VALUE, ARRAY etc.) at run-time. All data-binding in OpenInsight is handled through the DEFPROP property and it is the sole mechanism by which the form IO layer accesses data in the user interface. By specifying the name of a Basic+ handler function that the form IO layer calls to handle the request. This latter method can be useful when dealing with a complex control such as a grid, that might need to insert/delete rows and set cells individually if it doesn’t have something like an intrinsic OpenInsight-style ARRAY property. The name of an OLE event that maps to the equivalent of OpenInsight’s POSCHANGED event. By specifying the name of a Basic+ handler function that the form IO layer calls to handle the request in a similar fashion to the DEFPROP handler. The final item needed is the POSCHANGED event name so that the form IO layer can check when data has been entered into a cell for validation and update purposes. Allow Data-Binding: Checking this box tells the Form Designer to allow TABLE and COLUMN properties to be entered. This must be set if you wish to actually bind your control to the database at runtime. Required Support: Checking this box tells the Form Designer to allow the REQUIRED property to be specified. IConv Support: Checking this box tells the Form Designer to allow the VALID property to be specified. 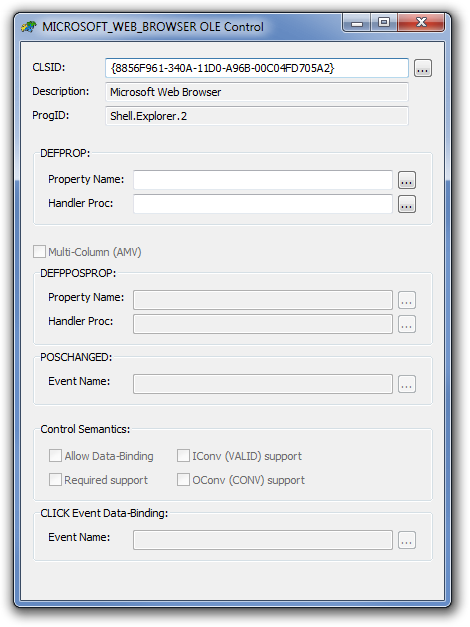 Oconv Support: Checking this box tells the Form Designer to allow the CONV property to be specified. Some controls, such as Checkboxes, update their data when clicked rather when they lose focus or change cell position. In this case the form IO layer needs to know the name of the OLE event to track if the control exhibits this behavior and this should be entered here. This entry was posted in Presentation Server and tagged Controls, DEFPOSPROP, DEFPROP, OLE, OLECONTROL, Repository on November 20, 2013 by Captain C.
One of the most powerful programming features of OpenInsight is the “Promoted Event” model, allowing you to write “global” event handing code that can be triggered for a variety of situations, such as for all objects of a certain type, or for all objects in an application, and so on. This helps to centralize your code-base and restrict unnecessary duplication, thereby making development faster and more robust. However, promoted events have also been one of the most opaque parts of the system and their use is somewhat awkward and error-prone because they rely on the dark art of naming conventions and manual record copying between tables. In an effort to rectify this we’ve integrated them into the OpenInsight Repository so they can be tracked properly and you can see at a glance exactly what is in your system. Some of you may look twice at the use of the “_” character for the CLASSID and ENTID Repository key parts: This is actually used as a placeholder to denote a null part in the promoted event key itself – their use is necessary because the Repository reacts poorly to a null CLASSID or ENTID. This entry was posted in Presentation Server and tagged Events, Repository on August 15, 2013 by Captain C.